As a multimedia container file format that ends up with .mp4 file extension, the MP4 file format becomes to dominate the media format market thanks to the following great advantages it offers. - Higher degree of compression and less loss of quality. - Better quality and smaller file size. - Suitable for video streaming over the internet. 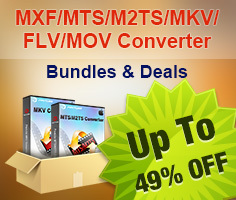 Have various different media types such as digital downloads from popular online streaming sites or disc media stored on Blu-ray or DVD physical disc, to get full entertainment of all those media types on your computer, smatphone, tablets, game consoles, TVs, etc, all you need is a splendid MP4 video converter, which helps generate a compatible MP4 file format for using on different devices or programs as your like. - Adjust output MP4 profile settings such as video codec, bit rate, frame rate, resolution, audio codec, bit rate, sample rate and channels to get better output video and audio quality. - Full video editing tools for you to trim MP4 video length, crop mp4 video file size, merge separate MP4 video into one, split large MP4 video into small clips, remove/replace audio in MP4 video or add external subtitle to MP4 video. From above charts, we can see that Pavtube Video Converter Ultimate can be the best MP4 video converter when compared with other four programs or other online competitors. The program has both Windows and Mac version and it also has perfect compatiblity with the new Windows 10 and macOS Sierra. As a powerful MP4 media conversion tool, the program has full support for all digital file formats with the resolution of 4K/2K/HD/SD and even commercial Blu-ray and DVD Disc. The biggest merits of this program is that it allows you to output MP4 in various different format types and also lots of different devices and programs preset profile MP4 file formats for different usage. In addition, the beneficial video editing function and output profile settings function also helps to enhance your media entertainment to another high level.